There’s a new truck in town. Name: Philly Flattop. Game: “Authentic Philly Cheesesteaks“. We spotted it this past Tuesday at Larkinville, big, blue and new. 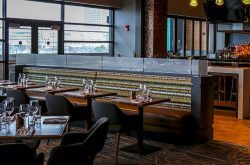 According to Twitter, Blue Lantern Lounge’s second food truck made it’s official debut at Kerfuffel at Canalside on July 26, 2014. My best bet is that we won’t see this truck on the streets as often as other Buffalo Trucks, at least not yet. Blue Lantern’s first food truck venture, “da Blue” is rarely on the road, open for the public. From what I can tell, they tend to stick to catering. (I could be wrong.) Update: Blue Lantern Lounge has sold “da Blue” food truck. 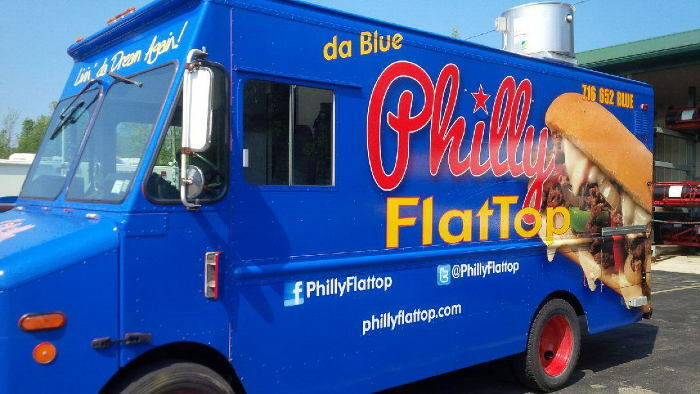 They have reported that Philly Flattop WILL be out and about. According to their calendar, Philly Flattop plans to be at Larkin Square again for the last three Food Truck Tuesdays in August. Plus, they have a few other appearances planned here and there like Concert for a Cure at Canalside. We have yet to taste a Philly Cheesesteak from the new blue truck let alone lay eyes on a photo of one, so we can’t report on the authenticity of their product just yet. However, I can assure you that our in-house, self-proclaimed cheesesteak expert is on it and will report back soon.